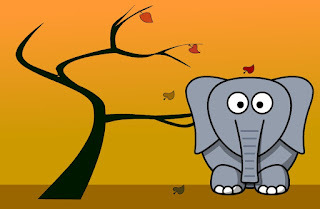 The Book Chook: Let's Celebrate Elephant Appreciation Day! Let's Celebrate Elephant Appreciation Day! What is it about elephants that fascinates us so? Right from our early picture book encounters we've loved them. Do you remember David McKee's Elmer, or Vipont and Briggs's The Elephant and the Bad Baby? Did you love Babar and The Saggy Baggy Elephant? Movies brought us Dumbo and The Jungle Book's Colonel Hathi. Throughout, we human beings have had a love affair with these ponderous pachyderms. Elephant Appreciation Day is soon - 22 September. What a great day to learn more about elephants or read some elephant books with our kids! Why not search out the books I mentioned above in your local or school library? While you're there, check out the non-fiction section (around Dewey number, 599) for information texts on elephants. #Create an elephant using leaves, glue and a marker for details. #Create an elephant by getting together with some friends and making an elephant shape with your bodies. #Create an elephant from cardboard, goggly eyes, pegs and pipe cleaners. #Create an elephant from clay, play-dough or plasticene. #Write a description of your pet elephant. What does he like to eat? What is his name? Does he ever do funny or naughty things? What makes your pet elephant special? 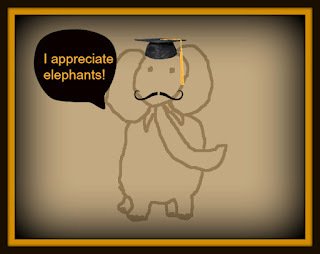 #Draw your pet elephant. Make her the star of her own special story or cartoon. #Invent your own elephant jokes. #Create a special space for a teeny tiny elephant to live. #Use the Comix Cartoon Creator at Aven's Corner to make a story about an elephant. If you like the idea of celebrating other special days with activities that help kids learn and create, click on the Celebrate button in The Book Chook blog's right sidebar for more tips. I have been taking a ton of Elephant photos over the last few weeks because there has been an art project on in Melbourne. I had been wondering what I was going to do with them all! Maybe I will post them on Elephant Appreciation day. @Corey Schwartz Another cool Elephant book - thanks for the suggestion, Corey. Great news about 3 Ninja Pigs!